Celebrating Three Years Over Nevada! Three years ago, we released the DCS: NEVADA Test and Training Range map. Since then, it exited Early Access and has received many updates, including a massive one two years ago that included 14 new airfields; new towns and cities; additional landmarks; and expanded, detailed texture area. Just as important, the map has been home to a huge amount of content that includes numerous missions and 10 campaigns. The Nevada map has provided a very interesting blend of desert aerial combat in the form of Red Flag Campaigns, Weapons Training, and Aggressors Training, with “fun” flying through Las Vegas, the Hoover Dam and other interesting locations. We’re happy to present to you this new Nevada map video that celebrates three years of Nevada flying! For next week’s Open Beta update, we plan new Hornet features and fixes like the Joint Helmet Mounted Cueing System (JHMCS), FPAS page, laser Maverick, and corrected air-to-air radar B-sweep. The WWII assets pack continues to grow, and the next ground unit will be the M10 ”Wolverine” tank destroyer. Based on a modified M4A2 Sherman tank chassis, it includes an open-turret with a 76.2 mm cannon. 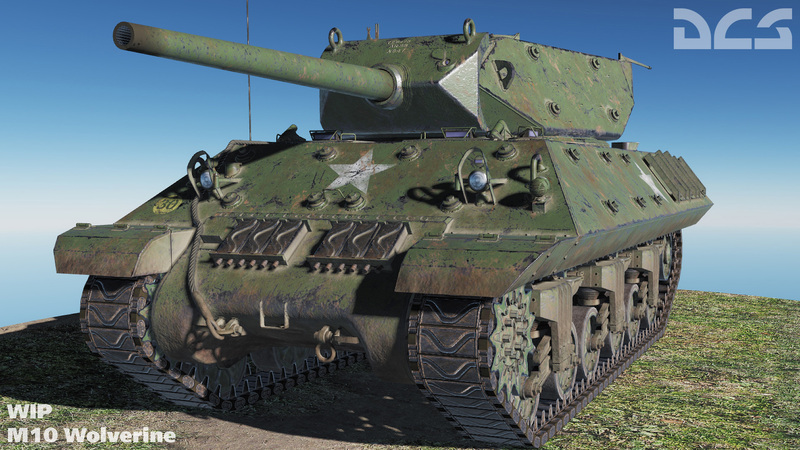 Produced by the US starting in September 1942, the M10 was the most important US tank destroyer of the war. Corrected FAB-250 pylon position on Su-33. F-4E and C-130 added to Iran. DCS: MiG-21bis and DCS: C-101 improvements. While new Hornet features and fixes like the Joint Helmet Mounted Cueing System (JHMCS), FPAS page, laser Maverick, and corrected air-to-air radar B-sweep are still on track to be ready next week, we need to adhere to our Open Beta release schedule and have time for proper internal-testing of these complex items. As such, these will be released in the next, scheduled Open Beta release on 7 November 2018. The DCS: F-14 Tomcat by Heatblur Simulations is now available for pre-purchase with a $10 discount. Early Access release of a feature-complete F-14B will be this winter. Hornet, Persian Gulf Map, and Su-33 Bundle Pack Available Now! Now available until October 21st, 2018, purchase the DCS: F/A-18C Hornet, the Persian Gulf map, and the Su-33 together for just $89.99! This bundle has an almost $150.00 value. Addressed an intermittent multiplayer host crash. Fixed a crash related to multi-monitor use. Corrected VR issues related to 4K monitors and cursor scale. Aircraft carrier catapult adjusted for low temperature conditions. Added work-in-progress update to properties of Medium and High PRF radar emission. There is a known issue with Medium PRF with high-aspect targets. Hornet ACM boresight mode extended to 10 nm. Numerous AJS-37 fixes and improvements. Added the Yak-52 to the Logbook. DCS World Helicopter Autumn Sale Pack Now Available! Now available and lasting until September 30th, 2018, we are offering all four DCS World helicopters for just $69.99! Normally a $199.96 value; this is a 65% saving on each helicopter. DCS World offers some of the most realistic helicopter simulations available on the PC, and nothing compares to the helicopter combat environment that DCS World offers. Starting September 5th, 2018 and lasting until September 30th, 2018, we are offering all four DCS World helicopters for just $69.99! Normally a $199.96 value; this is a 65% saving on each helicopter. DCS World offers some of the most realistic helicopter simulations available on the PC, and nothing compares to the helicopter combat environment that DCS World offers. Several more modules have been moved to the keyless protection system. These include the NTTR and Normandy maps, WWII Assets Pack, Spitfire, Su-33, AJS-37 Viggen, and the M-2000C. These modules are now tied to users accounts rather than keys. Many new Hornet additions to include preliminary AIM-9X, AIM-120 active and time-to-go timers, AIM-120 VISUAL mode and AIM-7 LOFT mode, EW page symbols, EW HUD, EW Offset, increased of ICLS needles size, and eliminated deck sliding after landing. Many new AJS-37 Viggen changes like corrected mirror reflections, adjusted normal maps, fixes to the SPA mode, custom cartridge settings, and others. Yak-52 changes include corrected textures for the 3-bladed prop, hide stick option added, tool tip improvements, primer animation corrected, and more.